To guide men in building strong personal relationships with Jesus Christ. 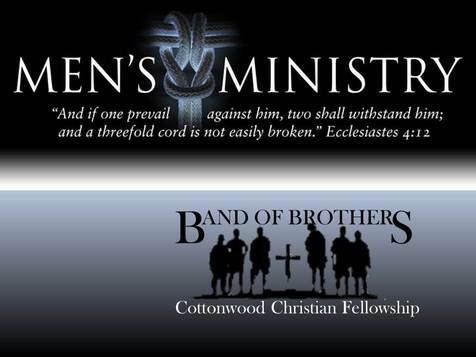 To unify men under the Lordship of Jesus Christ. To help men discover their Biblical position within the body of Christ and build awareness and application of their spiritual gifts for the building up of themselves, their families and the church, all while sustaining their spiritual growth and reliance on the Word of God and the power of prayer. This ministry is about men living life with real purpose. We achieve this by targeting and developing attitudes of true worship, fellowship, discipleship, ministry and evangelism. First: Demonstrate faith, trust and commitment to the Lord’s Word in everyday activities. Second: Develop an in-reach ministry for the men to prosper in their faith. fourth: Support Church leadership’s vision, goals and on going programs. Fifth: Minister to the local community with event development, participation, support and outreach for the lost.